Product code: NS439 Categories: Modern & Retro Jewellery, Modern Rings & Engagement Rings. 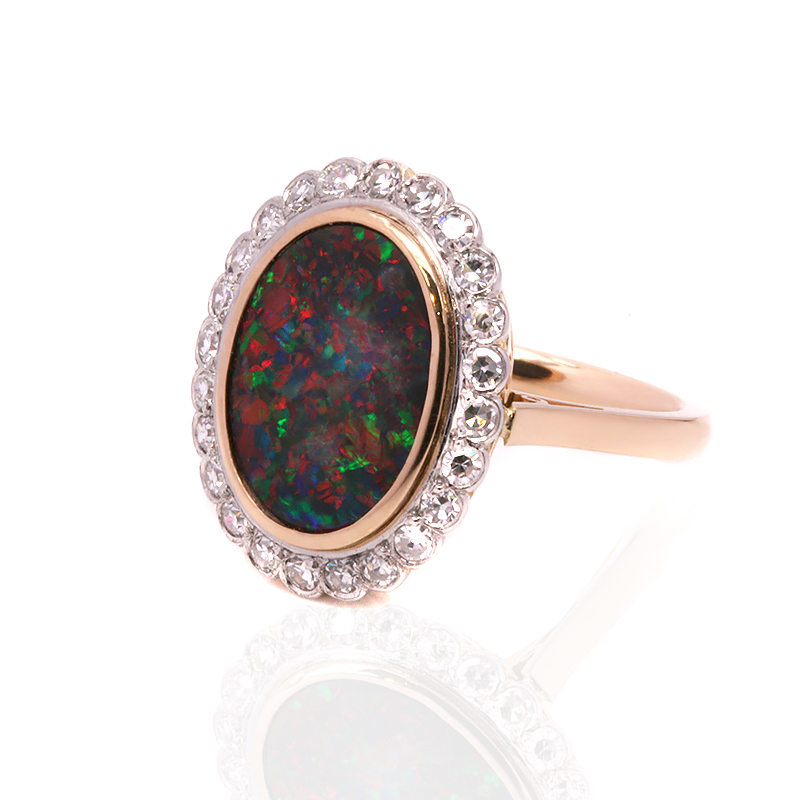 Here is an amazing 16 carat gold and platinum Lightning Ridge black opal and diamond ring that was hand made by our master jeweller and is a ring like no other. Sitting so proudly in the centre is a truly magnificent solid Australian Lightning Ridge black opal. Not only does Australia produce the most opals in the world, Australian opals are also regarded as the best in the world, with the Lightning Ridge black opal the best of the best. This opal was actually in an antique brooch that dated from the early 1900’s but was badly damaged and couldn’t be repaired. Measuring 2.79 carats, the spectral colours in this ring is just spectacular. The amount of red, which is the most desired, is just amazing and it is so easy to fall in love with just this opal alone. However not only was this ring made by our master jeweller to such an incredibly high standard, but in keeping in our tradition of dealing in antiques, surrounding the opal are twenty four antique single cut diamonds that total 0.43 carats and highlight the opal magnificently. The proportions of this ring are just perfect measuring 16.1mm across by 19.2mm and day or night, this is one ring that is sure to always be admired and appreciated for so many reasons. This is a ring that our master jeweller has created, and we are more than happy to it down and design and make that perfect ring for you. Modern technology and antique come together harmoniously to create a perfect and very unique ring unlike no other. Australia produces the most opals in the world, and Australian opals are also regarded as the best in the world. 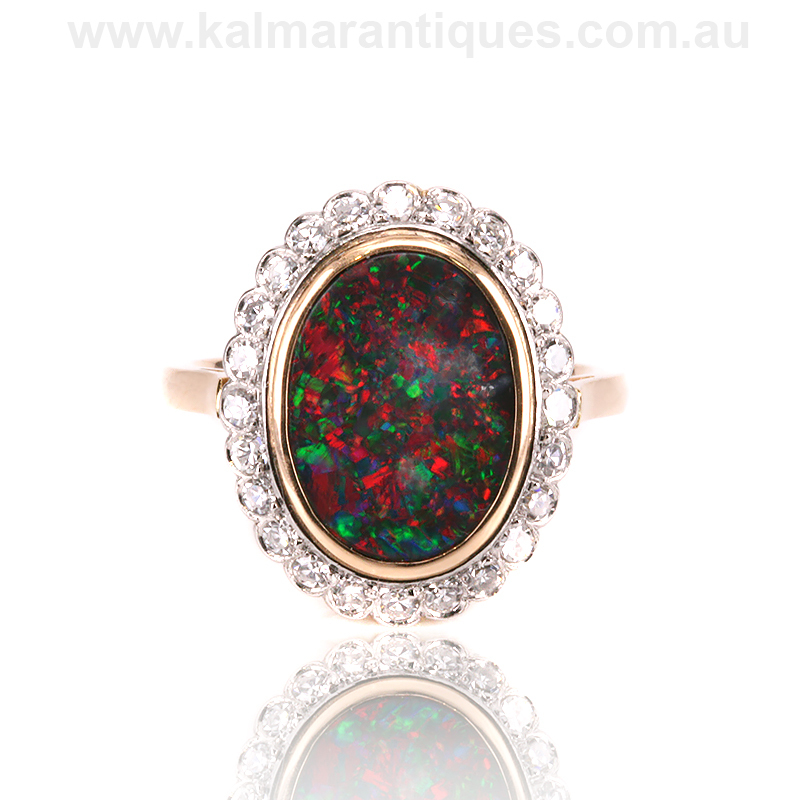 The best and most highly prized opals are the infamous Lightning Ridge black opal being the best of the best.